Spring is in the air. The snow is finally gone from the yard, and the city trees are beginning to bud with leaves. On another front, university has wrapped up for the semester, and many students have begun the process of spring cleaning in preparation for the trek home to friends and family. There are many different ways and styles people go about performing their spring cleaning. Many people bring out the dusters and mops to start making their living spaces as clean as humanly possible. Others prefer to bring out old boxes full of belongings and sell or donate what they no longer need until all they have are the bare necessities for comfortable living. When my thoughts turn to spring cleaning, I choose to downsize where I can and save as much space as possible in every aspect of my life, since it is cluttered enough as it is. So, when I was presented with an opportunity to review the Cooler Master MasterBox Lite 5, I was very pleased. Replacing the oversized case I had in my office with the Cooler Master MasterBox Lite 5 allows me to downsize and save some much needed space. At the same time, this project would kick start my home spring cleaning. Is this case able to truly change things up and make my spring cleaning worth the effort? Well, let us take a look and see what I discovered. After picking up the case at Jonathan Kwan’s on a rainy Sunday afternoon, I was eager to have a look at this new product. 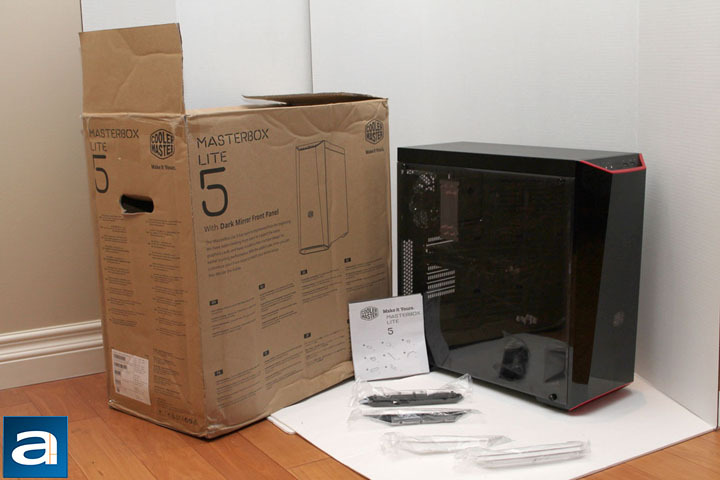 The Cooler Master MasterBox Lite 5 was shipped via UPS from Chino, California, and the cardboard box was tightly wrapped with a thin layer of protective white foam. When I removed the foam wrap from the outside of the retail case, I was actually a bit nervous. As you can see, the box containing the case arrived with extensive dents along the sides and the top. However, the foam wrap appears to have served as some measure of protection, as there were no punctures or cuts to the cardboard. Beyond this, the retail box is an average size and comparable to the Cooler Master MasterBox 5t retail box from a previous review. There is nothing noteworthy about the packaging of the Cooler Master MasterBox 5 Lite, as it is fairly standard within the industry. 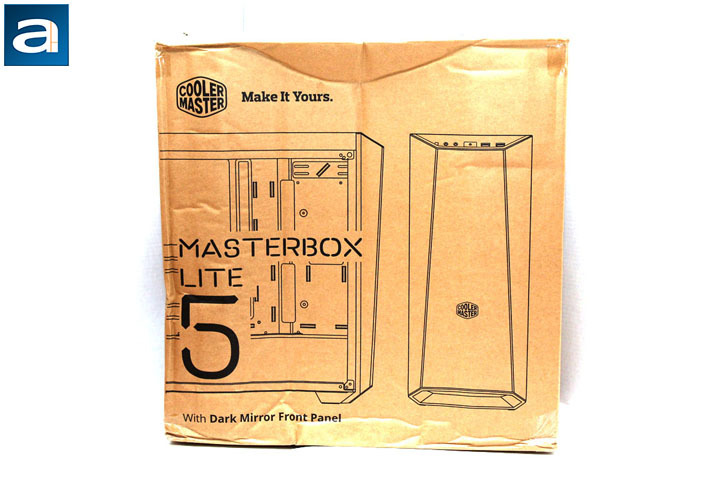 The box consists of brown cardboard and features a stencil of the actual case on the front side with the company logo and the classic slogan “Make it Yours” located in the upper left corner. The back of the box, in keeping with past trends, provides details of the case in various languages with the product specifications located on the side panel. Now, onto the contents of the retail box. Opening the box itself was simple with the aid of a box cutter. I was able to open the flaps and reveal the case firmly secured between two Styrofoam brackets. Due to the extensive dents of the retail box, removing the case was a bit of an ordeal; however, I was able to extricate the case which had been wrapped in a thin protective plastic sheet. The interior of the retail box contained typical accessories such as case screws, zip ties, mounting pegs to secure the motherboard, and an installation guide. Peering inside the case, I observed a small cardboard box fastened to the interior using zip ties. Inside this box were four components to customize the colors of the case, and to which I will refer to later in the review. - Product Weight: 4.96 kg, 10.93 lbs.